The statistic shows that smoking became a global problem over the last century. What is worse, the number of smoking teenagers is growing up dramatically each year. If 20 years ago you would rather see a grown up person smoking, now our streets are full of teens doing the same. Researches held all over the world show that in average one out of tree students is nicotine addicted. Girls and boys smoke in the same amount and usually don’t understand how harmful this habit is. So let’s learn more about main reasons and solutions to this problem. As well you may use any information of this article without worrying about its quality as we always offer you best essay writing service. Smoking at such a young age is extremely dangerous, as it increases the chances to become addicted and stay with this habit for a very long period of your life or what is worse for the rest of your life. Apart from that, leading an unhealthy way of life can lead to exacerbation of chronic diseases. Reason # 1. Do you know what an average excuse of a teen caught smoking is? «Everyone smoked and I tried as well.» On one hand, a teen is just trying to defense, but, on another one, he gives the biggest explanation on why teenagers smoke at all. Reason # 2. 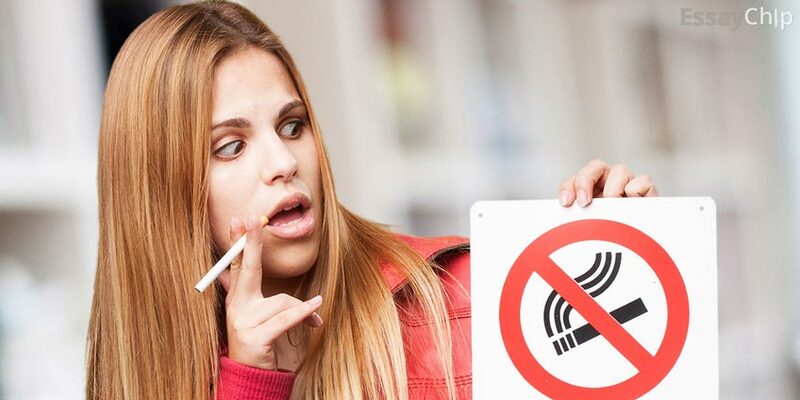 Another reason for smoking is hidden in a deep curiosity of teens, who just want to try something new. Moreover, they usually see peers who do the same. At first, they smoke one cigarette, then two, tree until it ends up with finishing the whole pack. At the beginning, you do not feel any addiction but later on you understand that your life is impossible without smoking at least one cigarette per day. There are those who realize they are in a big trouble, but they don’t want to give up as smoking as it is cool and popular among their peers. Reason # 3. The third reason for smoking is a tireless desire to become an adult. But how about those adults who don’t smoke? Are they just young ignorant people? Well, unfortunately, most of the teens do not realize that becoming an adult is a hard process of becoming someone in this world, finding a job and being responsible. Honestly, this tough process has nothing to do with smoking. Although, there is another process which may have a direct connection to smoking and it is called degradation. Nowadays governments of many countries try to undertake «anti-smoking measures», but that evidently doesn’t help. So what can be done by us to save the nation? Well, it might sound corny but you should start from yourself. Imagine what you can buy for money which you spend on cigarettes every day. If you really want to feel like an adult you should understand that you may become a bad example for other teens or your kids in the future. If that doesn’t help either, try watching a couple of documentaries about smoking and its effects on our body. Most of the teens never heard about the consequences but it doesn’t make them look better. All in all, it is only up to you to smoke or not, but before you take such a step, make sure to learn all about the consequences.